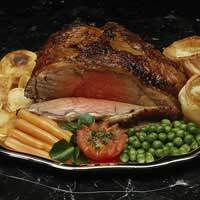 If you have a family tradition of a roast lunch or dinner on a Sunday then this will definitely be something you miss when you get to college. Nothing beats the waft of potatoes and meat gently cooking away in the kitchen while you flick through the papers and maybe tuck into a glass of wine or beer. You may think that's it's too complicated or expensive to recreate the tradition once you leave home but think again! Preparing a roast dinner is a great way to bond with your housemates and if you all chip in some money and help out with the cooking, it will be a really enjoyable and rewarding experience. Better still, why not really impress your parents by inviting them over for lunch. You can show off your new-found cooking skills and prove that you're managing to fend for yourself and eat well despite being far from the family kitchen. It's not much fun cooking a roast dinner on your own and it's also the kind of meal where it's easy to allocate tasks and for a number of people to work together in the kitchen. As with any meal that has a number of different processes and timings to negotiate, it's important to get organised before you begin. Decide exactly what you're cooking, which vegetables you're going to serve and make sure you give yourself plenty of time to do everything. While it is possible to do everything on the day, if this is your first foray into roast lunch territory, you should probably get organised a bit earlier than that. Here's a checklist of what you'll need to do. Check the cupboards and make a shopping list - don't forget important details such as gravy granules, or mint sauce if you're serving lamb. Check you have enough plates, cutlery and glasses for everyone. Go shopping - choose a chicken or piece of meat that's sufficient to serve everyone. You can prepare the vegetables now. Peel and chop the potatoes and place in a large pan of water so they don't discolour. Get baking trays and oven dishes out of cupboards. Set the table now to save time when you're really busy later on. Depending on what kind of meat you're cooking and how big it is, you'll probably need to start thinking about getting it in the oven around now. Always follow the instructions on the packaging. Preheat the oven to the required temperature and rinse the meat, if necessary. Rub chicken with a little oil or stud a leg of lamb with rosemary sprigs and garlic cloves, if you like. Par-boil the potatoes for a few minutes. Heat a little oil in an ovenproof tray and transfer the drained potatoes to this. If you're cooking parsnips, add these to the tray. Mix in the oil and place in the oven to cook for the remaining time. Check every 20 minutes or so and turn so they cook and crisp evenly. Check the meat and baste with the juices, if necessary. Put the plates in the top oven to warm them. Begin cooking any other vegetables (carrots, beans, etc), depending on their cooking times. Depending on the meat you're cooking, it can probably be removed from the oven now and set aside to rest a little. Keep the juices in the oven tray, place the meat on a separate dish and place the tray over a low heat on the hob. Use a serving spoon to mix the juices and pour in some red wine to de-glaze. This is going to be your gravy. If you like it thick, add some gravy granules or a little cornflour but the flavours from the meat should be sufficient. Once the vegetables are cooked, use some of the cooking water to add extra bulk to the gravy and simmer to reduce down. Carve the meat and place on the warmed serving plates. Alternatively, place everything on the table and carve there. Strain the gravy into a jug and enjoy your meal! Hopefully this should give you a rough guide to follow for your first Sunday roast. If you keep your cool and ask everyone to help out, if should be a complete success.